SINCE its origins, Carnival has been a festival for freedom of expression, where masqueraders could break free from the monotony of everyday life and go beyond their comfort zones. As such, getting that unique visual appeal is critical for the success of any masquerader. For almost three decades make-up artist and director at Beauti Bank Trinidad, Lester Rauseo has revolutionised the traditional Trinidadian look. Participating in band launches, soca monarchs and beauty pageants, he has brought his eccentric style and vision to an international stage. Rauseo along with assistant and model Kandis Roberts visited Newsday's Port of Spain office to share some make-up tips for Carnival as well as demonstrate the proper technique behind getting a flawless finish for this year's festivities. "For Carnival you can get away with murder. You can break the laws of make-up, it's a time when everything is bright and overdone. It’s a time when you can break all the rules. It's an opportunity to be as bold and flamboyant as you want to be. Colours like bright purple and pink often mesh well for Carnival." Before long, Rauseo gets to work on his "canvas", gently dabbing foundation on Roberts' eyes, lips, chin and cheeks. He explains that masqueraders should go for foundation slightly lighter than their natural skin tone, to assume a more visible presence for the stage or the fete. 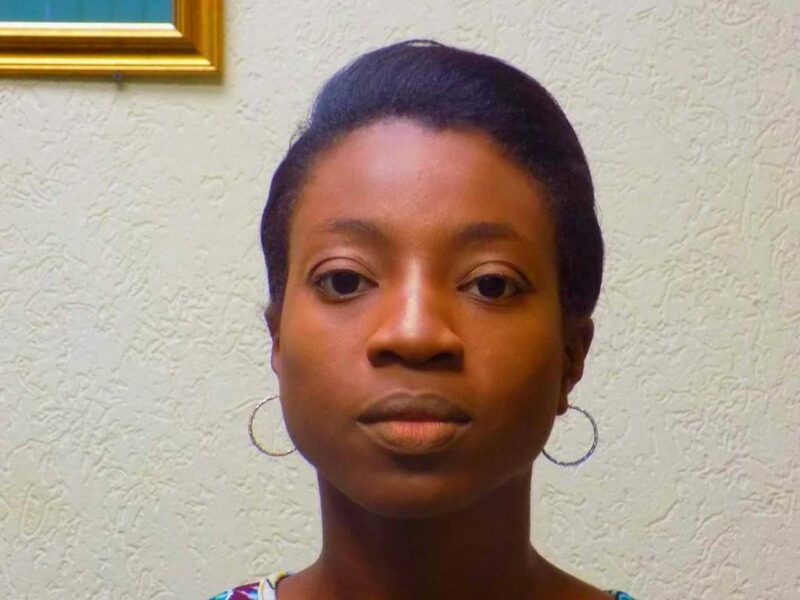 "We're going one shade lighter because Carnival make-up is lighter in general, that’s my technique it's also very important to take that foundation under the chin to the neck area. Most make-up artists tend to ignore that." After setting the base, Rauseo begins to apply the powder, carefully applying just enough to cover the foundation, he explains another important part of the process was placing one shade of foundation lighter on the eyelids. This, he says, allows for better contrast with the eyeshadows later on. He then applies dabs of Buttercup, a setting powder which settles into the furrows and ridges of the face over the foundation. He explains another vital part of the process is contouring, which in essence is defining the features for added appeal, and says contouring darker than usual for Carnival gives masqueraders that added zest, lending more definition to the facial features. 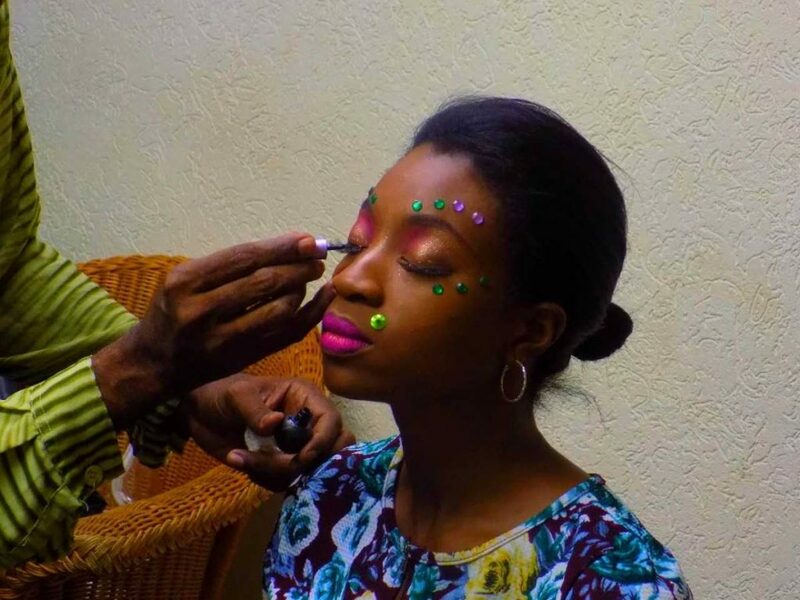 Make-up artist Lester Rauseo completes the Carnival look on Kandis Roberts' face. "It's under the cheekbones, contouring is the opposite of highlighting in that it's dark, so the cheekbones are necessary for exposing. Contouring the eyes sets up for the eyeshadow and brown is the number one base colour in make-up. You contour the nose all the way down for Carnival, most times you stop three-quarters along the nose bridge, but this is a Mardi Gras-type celebration." For people with darker complexion, dark shades of gold are recommended for highlighting the forehead, eyelids, while those with lighter skin should choose lighter shades of gold or silver. Eyebrows, he explains, are crucial for completing the Carnival look as he begins stroking eyeliner across Roberts' face. 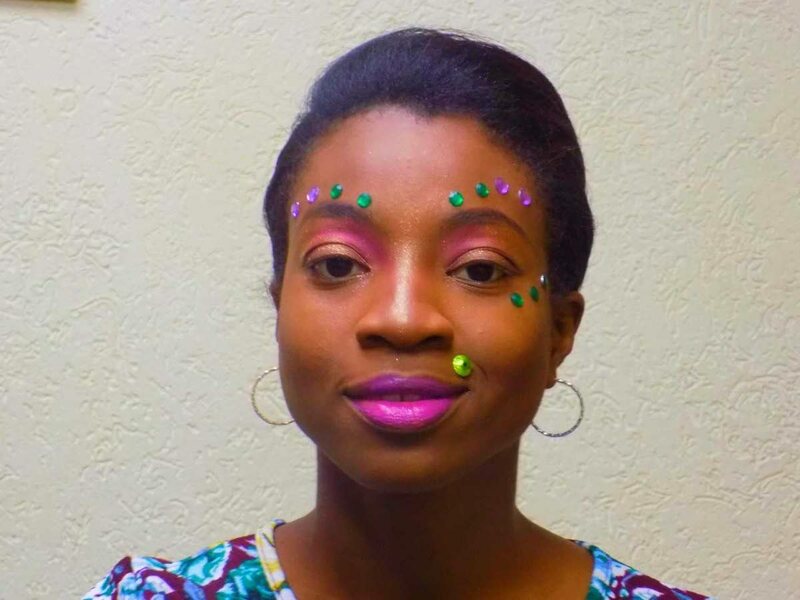 Once the foundation and powder have been applied, Rauseo begins sticking the gemstones, he says sequins are often used to complete the ideal Carnival look, but suggests placing them in irregular or asymmetrical pattern as they attract more attention to the features. In the finished product, Roberts' face appears more lively and energetic than before, as the deep purple lipstick contrasts against the gold eyeshadow and green sequins. Rauseo explains the Carnival look has changed from time to time but all techniques for make-up continues to place emphasis on the eyes, nose and cheekbones.